United States delegation led by Congressman Ron DeSantis (R-FL) visited Israel this past Saturday and Sunday and has studied the possibility of placing the United States Embassy in Jerusalem. In the past, Palestinian and Jordanian leaders have warned moving the embassy could spark violence in Israel, the Palestinian territories and the Middle East region as a whole. We posit the question of how one would be able to find this any different than the current situation. Obviously there would be little if any noticeable effect on Syria, Yemen, Iraq, the Sinai or even Turkey which has had a number of large terrorist bombings in the past few months. In Israel and the Palestinian Authority ruled areas it runs hot and cold on the levels of terror all depending on the signals they get from the ruling media. When Abbas takes to the airwaves and claims that he cannot control the uprising which is solely the expression of the desperation of the people oppressed by Israel, they know that this means it is time to rise up and try to kill Israelis by any means available. Then whatever means they find, stabbings or ramming with vehicles become the name for that Intifada which was how the last Intifada was called the Stabbing Intifada. The Palestinians decided by personalizing their uprisings instead of numbering them they would not be drawing attention to their nearly constant level of violence. Though Israeli defensive measures brought the level of stabbings down measurably, we still have the vehicular assaults as proven by the recent truck attack in Jerusalem. The reality is that the threat of added violence is exactly that, a threat. There will be no change in the levels of violence, especially in Jordan where their militarized law enforcement will not tolerate even peaceful demonstrations, let along any violence. Should Mahmoud Abbas decide to elevate the levels of violence and terrorism against Israel, then Israel will find the solution and implement one as rapidly as possible. That would be an Israeli problem and should have little effect upon the American decision to locate their embassy in the Israeli Capital City of Jerusalem. Israel promises that your embassy will be safe and guarded equally in Jerusalem as it has been in Tel Aviv and those guarding it will feel a small measure of greater pride guarding it in Jerusalem, trust us. But it will cost the United States status in the Middle East and North Africa (MENA) as the Arab and Muslim worlds react to the move. Well, allow us here in Israel to give you a little insight. You already lost that little edge you are so afraid of losing just by bringing up the subject for debate. Further, the level of loss will continue to increase for as long as the debate continues. Now there are two means of ending the sliding effect of the United States in the MENA world’s view, either by moving the embassy or declining to move the embassy and announcing that you are fearful of moving the embassy. Oh, you claim that fear would not be the reason; it would be so as to respect the feelings of the nations who have stated their opposition. Really, you think that works? Here is the reality, should you decide not to move the embassy then whatever amount of respect you believe you had lost in the MENA world would instantly be surpassed immeasurably. By not moving the embassy you signal now that you can be bullied by the nations of MENA simply claiming that your intended act would hurt their feelings and you have no stomach for any disagreement, let alone an actual fight. You claim you really want to not lose any respect from the MENA nations by moving the embassy but the truth is to regain everything that they claim you are and will be losing by moving the embassy and gain measurable amounts of extra credit for making the correct choice, then simply move the embassy because ignoring threats and saying what you believe and then acting on it counts for everything in the MENA world. What you need to learn if you do not yet understand the MENA world is that everything is a threat and every threat is a bluff. The only thing which gains you respect is calling everyone else’s bluff. When you call their bluff, then they need to decide whether going through with their threats is worth what it may cost in the future and if they back down, how they can mitigate their timidity. Their reaction to your not moving the embassy is pocketing the knowledge that if their world threatens violence then the American back down. This will only serve to make their actions towards the United States as cowardly and able to be scared by threats of violence. Once you decide to move the embassy, the ones who threatened you will influence others from their world to join in making greater threats hoping to still make the United States back down. 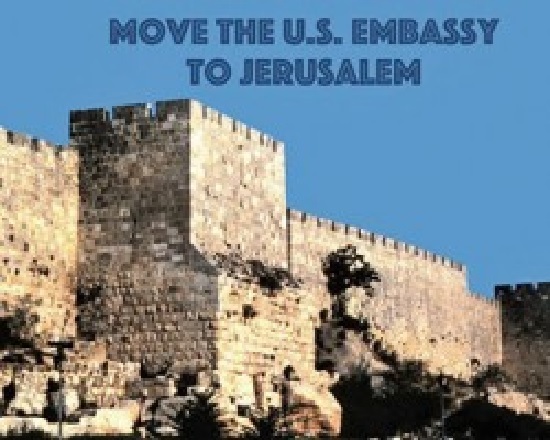 The announcement that you will move the embassy threatens their image of the United States as a nation which can be backed down with simply threats as that has happened ever since the first announcement for moving the embassy in the 1990’s. These threats will continue and grow or lessen according to the believed potential for the United States to move the embassy. Remember that a certain level of violence equal to the ability of the terrorist organizations to penetrate the security and intelligence of the United States exists at all times. Their efforts increase whenever the United States either acts against the terror interests or when the United States announces plans that those controlling the terror interests wish to prevent. There is but one means to remove the threat level over moving the embassy to Jerusalem once and for all, move the embassy. Do not even announce the move, simply in secret in concert with the least number of Israeli departments and individuals as the less number of people knowing of the plans, the less the possibility for any leaking of the plan. It should be possible for the United States to build an embassy building using security approved construction personnel from the United States who can hold to a cover story. 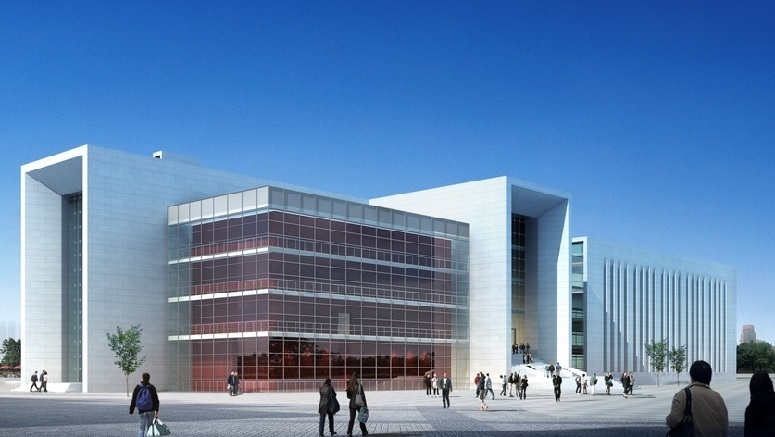 Make the building being constructed be referred to as a new office building from where a series of headquarters of American companies will be operating. This would qualify for why a building is being built by American workers in the center of the modern downtown of central west Jerusalem. Then once the building is completed and everything is readied for operations, the grand opening can reveal the new name which will appear on the outside of the building which has been covered since it was first mounted. The cover comes off and it states “United States Embassy” and then be ready for about ten to twelve weeks of screaming and shoe throwing. Place additional Marines around every MENA embassy and meet the reaction head on. Once the MENA nations and groups have vented sufficiently to make their chest beating need be satisfied they will quiet back to normal, which is not all that quiet as the NSA, CIA, Military Intelligence and other data gathering agencies can tell you and back it with evidence in spades. Then everything can return to its nominal level, not its normal level as nothing about the MENA nations of the world can be deemed normal, so nominal will have to suffice. Further, the embassy will be in Jerusalem, West Jerusalem but still Jerusalem, and that will set a precedent for other nations and it will remove the claims from some out of the MENA world who claim that all of Jerusalem belongs to Islam and that neither the Jews nor the Christians have any rights, claims or history to or from Jerusalem and that neither Jews or Christians ever held Jerusalem because before Islam conquered Jerusalem it had no previous history because everything in Islam begins and ends with Islam and no other existence holds even the level of fancy as far as the Muslims are concerned. Moses, not a Jew, Noah, well, he really was not a Jew, Abraham, not a Jew, Isaak was never taken for sacrifice on Mount Moriah because that was Ishmael just as the Koran says and the Hebrew Bible is a misrepresentation because Judaism made up everything because only the Quran is true and the Christian Bible is also just a pack of lies and misrepresentations also because only the Quran tells truths and Jesus was an Islamic prophet, nothing more. Jesus will play a role in the end times according to the Quran. Jesus will return as a prophet readying the world for the return of the true final prophet of Allah, Jesus will return and make the world suitable for Muhammad who will come and lead the world into the age of perfection Islamic style. With this as the prescription for our future according to the Quran and Islam, what possibly could be the terrible consequence for moving an embassy to the Israeli capital city? Face it, there is nothing to fear but prolonging the agony by continuing the debate as the law declared the embassy move into law and all any President can do is prolong the agony so why not go for the ecstasy and just move the embassy to Jerusalem and get ‘er done!. The existence of anti-Semitism across Europe, Canada, the United States and the rest of the developed world, particularly on college campuses, is growing and will soon be beyond control and spread throughout society. 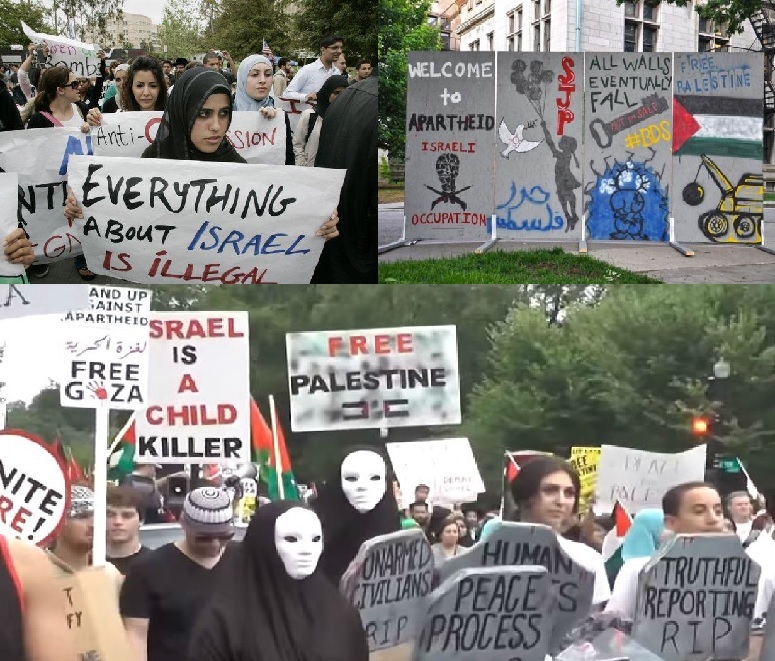 The first waves will soon break out as today’s college students being steeped in anti-Israel, anti-Zionist and anti-Semitic programs and virtual pogroms graduate and bring their toxic views into the political world and then the workplace and society as a whole. These indoctrinations are presented as presumed pro-Palestinian protests such as Israel Apartheid Week, mock checkpoints, demonstrations blocking campus access portraying the Israeli security barrier as the modern version of the Berlin Wall or the Warsaw Ghetto Walls as well as faux eviction notices placed on Jewish and pro-Israel students’ dorm rooms claiming their rooms are to be demolished as protest of terror home demolitions and simple, straight out physical intimidation of Jewish and pro-Israel students. For further observations and documentations one can start with these two articles; Pay No Attention to the Man Behind the Curtain and Hotbeds of Anti-Semitism in British Academia or use the results from a simple search engine results for anti-Semitism on college campus we performed as a free service to make life easier. This article is not out to bang the drum which already has been accomplished to the point that a complete percussion section has been added to the anti-Semitism orchestrated noises around the world just covering college campuses and in some cases it spreading to public high schools. This is following a normal progression for many politicized items as has been tracked with other subjects such as global climate change, equal opportunity, affirmative actions, LGBTQ rights and other highly charged political subjects from our modern societies. We will be taking a different tact driving to perceive what is probably the one major change which if taken would help rid the entire developed world from this pernicious evil. We will leave the proof to the links above and what will probably be more than sufficient numbers of articles which are sure to continue to surface. That could change and do so with a rapidity that would astonish the world and could be right around the corner if only some specific events and particular actions taken by some crucially critical people would materialize, but such things are unfortunately not looking ready to occur. So, let’s dive in and see what needs to be shaking. One of the first items which everybody a week ago thought was fair accompli and about to happen as soon as all the arrangements were done and ground was broken was the repeated statement once more by a candidate for President of the United States that the American Embassy in Israel would be moved from Tel Aviv to Jerusalem. Candidate Donald Trump promised, and we quote, “We will move the American Embassy to the eternal capital of the Jewish people, Jerusalem,” speaking to the American Israel Public Affairs Committee (AIPAC) in March. Further he stated this important add-on stating, “The Palestinians must come to the table knowing that the bond between the United States and Israel is absolutely, totally unbreakable.” Well, here we are in week one and already the moving of the American Embassy to Jerusalem has gone from we will to a process where ramifications and complications must be weighed and a cost/benefit analysis performed and all the other irrelevant items being spit out all in an effort to say we are going to do the same old same old. We have already heard of Jordan, the Palestinian Authority and other Arab allies having warned the White House of severe repercussions should it proceed with the move. 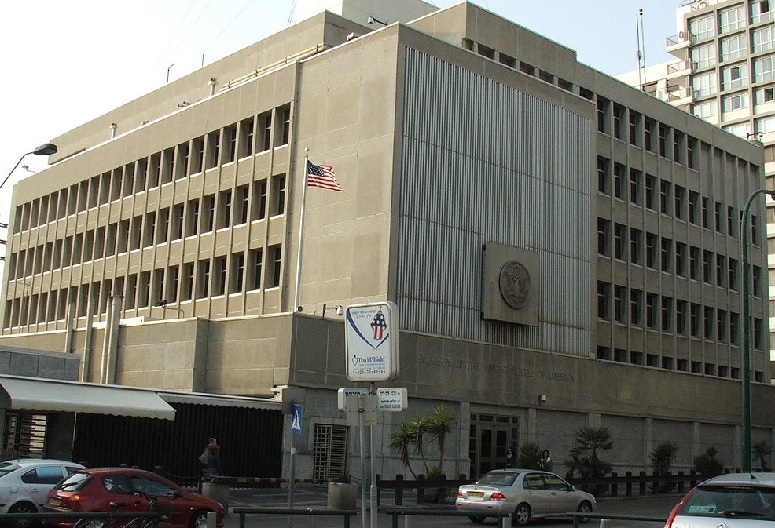 The threats included a threatened review of bilateral relations with both the US and Israel plus warnings of an upsurge in violence should the embassy be relocated. Please do not tell us that the Trump campaign were not aware of these ramifications when they followed the well-worn path of lying to AIPAC knowing full well that they would turn everything over to the State department and Pentagon and either or both would come back with a report warning against such rash actions as they would inflame the world and the ramifications far outweighed any benefit if there could even be an argument that there exists a benefit. Further, they would question the expense and warn that such simply was politically risky should any of the threats of violence be traced to having moved the Embassy, which the State department would warn they would most likely find as the cause of any terrorism targeting American facilities overseas. So, Trump is not going to be as pro-Israel as advertised, and why should he? Expecting President Trump to be more pro-Israel than Israel is ridiculous, as it should be. We learned this centuries ago and it was most succinctly stated by Rabbi Hillel who wisely asked, “If I am not for myself, then who will be for me? And if I am only for myself, then what am I? And if not now, when?” When, as we mentioned yesterday, the Israeli Security Cabinet voted unanimously to delay discussion on any law annexing Maaleh Adumim, can we expect for President Trump to stick his neck out and move the American Embassy to Israel to Jerusalem when the Israelis main decision makers unanimously refused to even consider annexing just a suburb of East Jerusalem? Of course that would be ridiculous. For proof just read Hillel above and it plainly states that step one will always be us being for what we hold dear before we can expect others to act similarly in our interests. Perhaps it would be a good idea to inundate the members of the Knesset’s e-mails with copies of Hillel’s quote followed by a simply Yiddish question, “Nu?” implying to ask what have you done recently which changes anything. Israel acting weak and timid reflects on everything worldwide simply because Israel is the exemplary representation of Jewish pride and strength and of late Israel has shown neither for quite some time. When Israel acts decisively and boldly projects strength and confidence taking whatever steps necessary to protect their people and the future of the Jewish State, it becomes reflected in the actions by Jews in the world and affects the way Jews are treated. When Israel demands respect as she did during the first half of her brief history, the world respected the Jews and allowed for Jews to be proud and live holding their heads high. As Israel has mired herself and given concession after concession with nothing to show for any of it as the land for peace more represented land for terrorism and Israel appeared weak and Jews started to wear long faces and are soon, if not already, hang their heads and shuffle along giving once again the image of the Jew ready to be kicked and ill-regarded. The ghetto Jews, as it had been called throughout much of modern history, was again the view. The Jews were those people who are to be blamed for all the ills in the world, all the wars, all the hatreds, all the destitution, all of any and every evil imaginable and the Jew could be kicked and spat upon and they would shuffle off accepting any scorn. This persona has become accepted on all too many college and university campuses in the developed world. As Israel is demeaned and seen as threatened and not really taking actions to protect themselves, this places the Jews across the world in jeopardy of attack and other forms of anti-Semitism. These acts have already made numerous cities across Europe actually dangerous to Jews to even so threatening that, as in Malmo, most of the Jews are packing up and departing. The numbers of Jews making Aliyah from France this past year was the highest since the end of World War II and many times the average for any year in the past half century. Further, the Arab world is using their oil wealth to finance those NGOs who coordinate numerous campus groups in anti-Israel and anti-Zionist programs with very obvious and well-coordinated demonstrations and events demeaning Israel and Zionism and by an extension anti-Semitism as many times these actions also lead to direct targeting of the Jews on the campus sometimes placing their lives and health in danger. As noted in the articles linked above, there are campuses in Britain where Jews do not even apply as the atmosphere is that toxic. This is a direct result of Israeli passive resistance to terrorism and apparent trepidation to acting boldly to suppress those acting against her. This has to end but for that to come to pass Israel will need to elect a far more active and bold leadership. This can be done but first an election is necessary and the Israeli Zionists and related activists will need find and promote someone to lead one of the existing parties and then support that party with sufficient votes that they either are the party making the coalition or be the main partner in a coalition with sufficient influence to force definitive action. The United States election set in place an opportunity of a lifetime. The election of Donald Trump as President and the fact that for the first time in memory the House of Representatives, the Senate, the White House and soon even the United States Supreme Court will be Republican or conservative making support for Israel, especially as a fair percentage of Democrats in Congress also support Israel, a given, freeing Israel to act without any ramifications from Washington. This is a situation which has not been seen since the founding of the modern state of Israel and may never return again should it disappear in the next election, a certain possibility as the opponents to President Trump will throw everything they have to at least take back the House of Representatives if not also the Senate. There are no guarantees in American politics but the stars and planets have aligned along with the Congress and White House to favor a bold and take-action Israel, now all that is necessary is leadership willing to take action which will define the state of Israel and the state of Israeli politics for the foreseeable future. 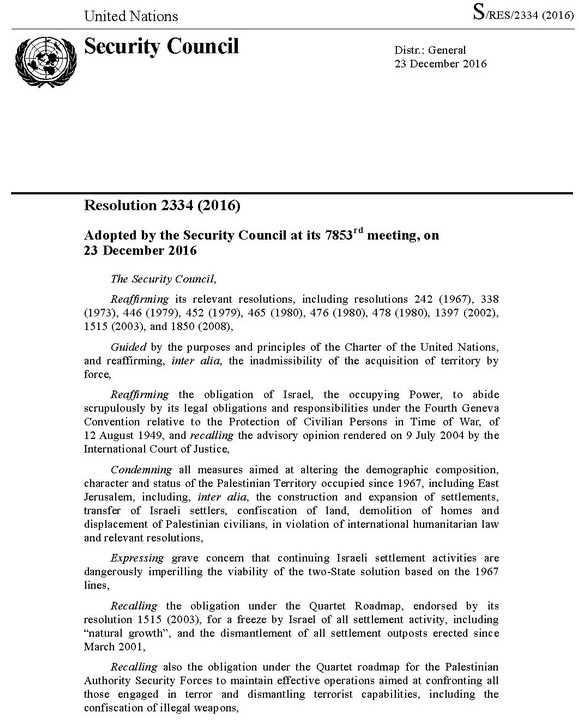 The entire reason for the presage of UNSC 2334 by President Obama and his administration was in order to set up this current Paris conference where his plan is to press for them to advise for the recognition of a state for the Arabs. This would need to be pushed and be ratified and presented officially before noon EST of January 20, 2017 and then taken for a near immediate vote by the UNSC on a resolution recognizing such state, setting its borders as probably the Green Line, President Obama’s wildest dream, and making it a Chapter Seven Resolution which is enforceable by military force. 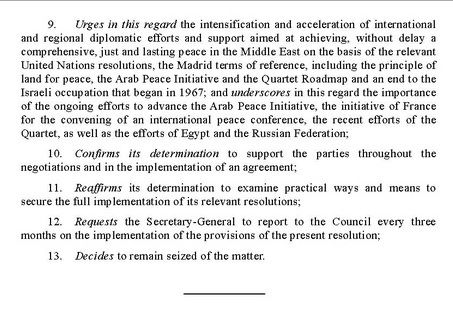 Such a resolution would make any attack upon Israel for the stated purpose of forcing them from the lands that the United Nations gave to the Arabs for their state as legal and fully backed by the nations of the world. Such a resolution would also place any nation aiding Israel is such a war as vulnerable to being brought before the International Courts and sued to cease and desist or face sanction and possibly military force to end their support. Basically, such a resolution would tie the hands of every nation to turn their hand against Israel bringing the Biblical prophecy of the world turning its hand being against Israel and every nation becoming the enemy of the Jewish State. We hope we do not have to remind anyone of what follows as there are four horsemen in the New Testament and the Messiah in the Old Testament and the following is not pretty at all. But that is the direction that the European Union, President Obama, Secretary of State Kerry, other select people from the Administration and many of the Arab World all would like to see become reality. President Obama is in such a rush because first he wants to get even with Israeli Prime Minister Netanyahu for opposing the Iran treaty and not respecting President Obama and bowing to his desires at every turn and because he realizes that since Hillary Clinton did not win the election as expected, that President Trump is not going to continue the war against Israel and might change things away from the current direction making this the last time in the foreseeable future that forcing this solution and the making of a new Arab state possible. President Obama is aware that such an opportunity to force this issue is now or never and he cannot rest without giving it everything he is able. The reality is that the political winds are changing and are going to blow for a while in a completely different direction and it is very probable that the world’s attentions will be swinging away from the Middle East and become more centered on economies and containment of the troubles plaguing the Middle East to only the Middle East which will also bring the refugee immigration, or should we say invasion, to a quick and unmerciful end. The war in Syria is likely to be brought to a close with whatever agreement is necessary being imposed and likely the nation made into three states; one Alawite under Bashir al-Assad; one Kurdish which may even include some of the lands from northern Iraq included and the state of Kurdistan, which had been a promise that the British made during World War I but found oil more important than their promises, finally brought into fruition; and the final a Sunni state which could very easily be divided between Turkey and central Iraq leaving southern Iraq as either the remnant of Shiite Iraq or merged into Iran. These divisions would respect tribal and ethnic division with the Sunni with the Sunni, the Shia with Shia and the Kurds finally realizing their independence. Such a strategy would also provide the Middle East with much needed ethnic borders and potentially greater security and peace, imagine that. That leaves Libya which could be divided into so many smaller states except that would create the problem of constant wars between the tribes or a larger problem of a neighboring state of terrorist forces taking hold of this dysfunctional area. This is already a problem but even the terrorists found attempting to establish a safe area in Libya to be next to impossible. Sometimes conflict is unavoidable and Libya has been a cauldron of trouble ever since the Romans and Carthage fought their wars there and during the Caliphate and Ottoman eras with the Barbary Pirates and even up to the time Thomas Jefferson sent the United States Marines into Tripoli taking the harbor and forcing an end to the pirating of American vessels, well, until the next time they thought America had been weakened and had to be taught again that they were mistaken. These were the Barbary Wars, 1801–1805 and 1815–1816, bracketed the War of 1812 where the British attempted to retake their former colony and failed. The Barbary Pirates figured such a war had weakened the United States and needed to be shown otherwise. The Italians were given Libya after World War I and the breakup of the Ottoman Empire until 1947, approximately the time many of the European nations resigned from their colonial holdings. For more on Libya and its problems through the ages, one can go here, and hopefully that will be sufficient coverage of Libya. Israel, in the meantime, will eventually be granted all that which was and is still promised her. This means that the eastern border will end up being the Jordan River. The only decision the world need make is how much drama, needless suffering, necessary time to undo the damage caused by the broken promises, and the number of lives, both Arab and Israeli, will be wasted getting to the rightful and just fulfillment of promises. For those who are going to challenge about the British promise to the Arabs that they would be granted a state within the British Mandate, that was satisfied when seventy-eight percent of the British Mandate was used to make the Arab state of Jordan. The remainder, as stated in the Churchill White Papers, was to be granted the Jews for their homeland. Those claiming the division suggested under UNGA Res. 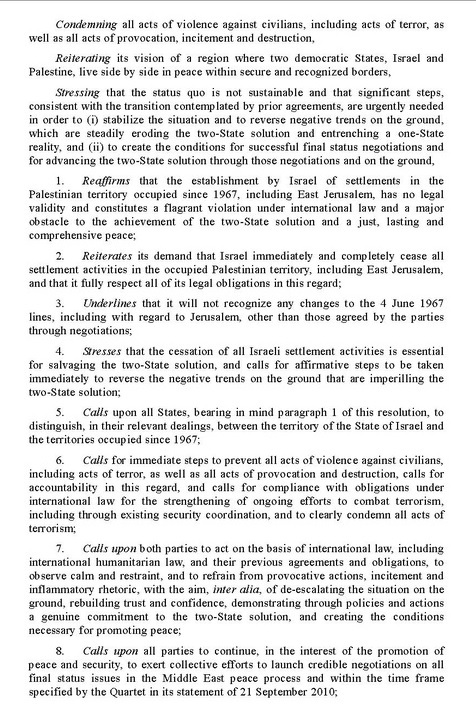 181, that division was merely a General Assembly Resolution which are suggestive in their enforcement and as soon as either side refuses such a resolution it becomes null and void and cannot be resurrected no matter how badly one desires to steal as much land and make Israel so vulnerable as to make her defense impossible just to see Jews murdered and Israel destroyed again. The Arab League refused that solution and invaded Israel on May 15, 1948; the very day Israel came into being with the Jordan River as her legal boundary. The problem the world is having over Israel can be simplified to one thing; many, possibly most, of the world do not believe nor desire that the Jews be permitted their homeland. The Western World and much of the remainder of the planet are fully aware of the ancient history of the Jewish People in Israel and their Capital city, eternal Capital city, of Jerusalem. These anti-Semitic views desire the Jew to be the tiny minority which is defenseless and can be beaten, stolen from, demeaned and otherwise simply used as a punching bag by any and every nation at their whim. They want Jews not permitted to own land or have any property of their own beyond a suitcase and whatever they can carry at a moment’s notice. They desire the Jew they abused for the past twenty-five-hundred years with the brief exceptions when they revolted and threw off the yokes of Greek Rule and then Roman Rule. They want the Jew to continue to suffer the intended punishment forced upon them by the Romans with their dispersal which was intended to end the existence of the Jewish People. The Jewish fate was to be the same as every other people the Roman treated thusly such as the Carthaginians and various other tribes whose names have been lost to antiquity and are known only to those who study ancient histories and even they likely miss a good number of peoples who have been defeated by the conquering empires from Egypt, Hittite, Minoan, Persian, Babylonian and on through the ages. The Chinese, Mongols, Japanese and Indian in Asia and the Aztec, Inca and others who ruled before the European colonization in the Americas where people who were erased from history as after conquest they assimilated and disappeared. Even the Jews had their lost tribes when the northern ten tribes were carried off by the Assyrians and were never seen again though there are beliefs that these tribes are now returning to Israel from their varied places around the globe. Some who desire the destruction of Israel believe that it is necessary otherwise their religion is devalued. This was the historic position of numerous Christian religious groups and was even named replacement theology. This form of preaching exists today and was exactly what was preached at the Trinity United Church of Christ in Chicago under the direction and religious teaching of the Reverend Jeremiah Wright and what President Obama listened to during sermons for the twenty years he attended this church. His claim to never have listened or heard these preaching has actually made them even more dangerous as their effect was then subliminal and affecting President Obama’s thoughts through subconscious influences and could have been partly responsible for his determination to destroy Israel and thus the Jewish People, just saying. The damages of replacement theology was based on the supposition that the Jews had been cast off by Hashem and were now under the influence of the devil, except there is no devil or hell in traditional Judaism, and thus were replaced by the Christian Church. With time the Christian Church became the Roman Catholic Church and the Eastern Orthodox Church. Then would come the Protestant Reformation where the protestant churches each replaced the Catholic Church. Somewhere off on another argument is Scientology but that gets way too complicated. The one item which was necessary for all these replacements to remain valid was for the Jews never to return to Israel as once the Jews returned to Israel, then the promise of their eventual return from exile by Hashem would be fulfilled and thus mean they were still the Chosen People and invalidate their replacement as such. Then there is Islam which basically claims to be the final and only valid religion of Hashem, except now they change the name to Allah, and according to Islam the Christians have joined the Jews as having been replaced. This is the ultimate replacement theology because the Muslim took the precaution of claiming there can never be another religion as they are the final rendition of the Abrahamic faiths. Islam also claims that Allah has promised them they will conquer the world and end all these false faiths through whatever means necessary. It all gets messy after a while but everybody agrees that the Jews are not to return except the Muslims in the Quran do accept that Jerusalem and Israel are the homelands of the Jews, just do not tell the Palestinian Arabs as they would get very upset with you. The one agreement of the Western religions is that the Jews must not be allowed to return and set up home in Israel and especially with Jerusalem as their Capital City; well, until sometime in the late 1960s and early 1970s when many decided maybe there was room to permit the Jews to return home. Thanks. Anyway, apparently that short allowance has worn out and passed it use-by date and been rescinded. Now the United Nations, European Union, United States State Department (the same United States State Department which advised President Harry S. Truman not to recognize Israel but Harry listened to what his mother taught him as a child, go Mom! ), numerous European countries, politicians around the globe, the Arab world, the Muslim world and many in Hollywood (where would we be without Hollywood thespians telling us what to think) and who knows who else, maybe Communists and Scientologists (though who knows anything about the Scientologists) all attempting to uproot Israel or weaken her until she cannot defend herself and find some means to eliminate the Jewish State. Did the world learn nothing from the attempts thus far to eliminate Israel and how miracles have saved her to date? In 1948 Israel did not even have a military, no chain of command, the British had taken every weapon they could find, there was no real Israeli Air Force, an Israeli tank was a car with a large caliber gun and a half dozen Arab nations and seven militias attacked within hours of the sun rising on Israel for the first time in nearly two thousand years and somehow Israel survived. In 1967 Israel was outgunned and outmanned by approximately hundreds-to-one and in Six Days took the Golan Heights, liberated Judea and Samaria from Jordanian occupation (yes, you read that right, Jordanian occupation) and conquered the entirety of the Sinai Peninsula surrounding the Egyptian Third Army. Miracle, come on, you can say it, miracle. The miracles have continued since then as in a recent Gaza conflict where there was one such event as here is one of the many articles documenting this miracle, praise Hashem. Here is what was reported by the actual Iron Dome commanding officer who related the story. The truth is Israel cannot surrender a single inch of the land the world demands she grant to those sworn to her destruction. Read yesterday’s article and view the pictures there and at the look provided and you can see how if Israel gives the Arabs the Judean Hills all of Tel Aviv to the Mediterranean Sea is visible. The same goes for Haifa and Ashdod and Netanya. The entirety of the central Israeli coastal plain would become uninhabitable as shoulder fired wire guided anti-tank rockets which are guidable could be utilized to target individual structures up to half way across Israel. Rocket and artillery fire could be sight adjusted targeting central downtown Tel Aviv. Jerusalem would be completely cut off from the remainder of Israel and West Jerusalem could be starved into submission. Ben Gurion International Airport would become a shooting gallery and no plane could land or take off with any degree of safety. All of Israel could be brought to a standstill at the mere whim of Mahmoud Abbas, assuming he remained in power. 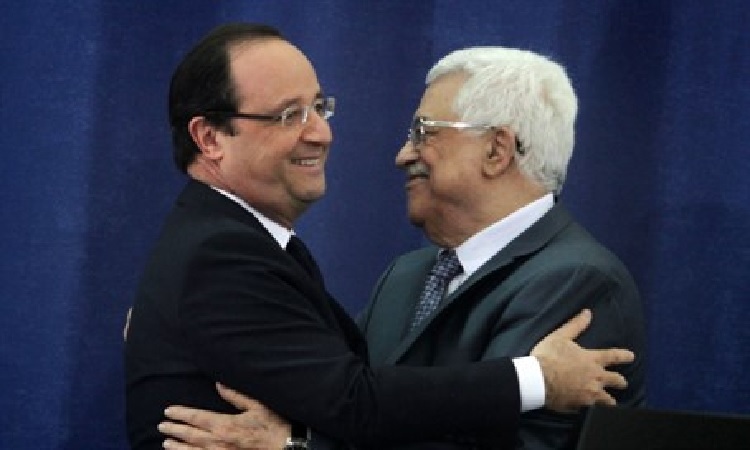 The chance that Hamas or Islamic State would replace the Palestinian Authority would be more than probable; the only question would be which one would move first as that would be the reality Israel would face within months of such an eventuality as is being considered in Paris. Finally, there is one saving grace for as long as the world does not force Mahmoud Abbas or anybody who would follow him as leader of the Palestinian Authority to accept such a peace, they would have to turn down any offer which left anything of Israel intact and should the world manage to remove the Jews, then they would flee from such a situation. The reality is that once Israel is removed from having the IDF provide security in all of Judea and Samaria, then whoever leads the Palestinian authority and the rest of the security and leadership would be dead within six months as whichever terror group replaced them just as what happened in Gaza. Abbas knows this and that is why he may talk of peace but he will never accept any peace as he has enriched himself and plans to live well and spend the stolen funds as do the rest of the Palestinian authority kleptocrats. Ridiculous as it may seem, but Mahmoud Abbas is an ace in the hole as he will never accept peace whether it comes from the European Union, United Nations or whatever council the future provides, and that is something Israel has counted on in the past though few will admit such.